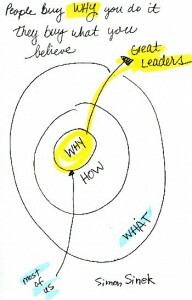 I recently read Simon Sinek’s book Start With Why after watching this TED talk…later that week, walking through the hall at work, I saw Sinek’s diagram on another person’s whiteboard! Talk about serendipity! Sinek’s key point is that WHY you do whatever you do is more important to your target audience or customer than WHAT you do. I find myself coming back to this idea again and again. I am very passionate about my own WHY. I get excited about my facilitation and communication work because it allows me to give back, to help others experience some of the benefits that I enjoy from life in cohousing and from applying this work to other aspects of my life . (Read my speech “How Cohousing Has Made Me a Better Person” for more background on this. WHY is the first question I ask a potential client, and it is the question I keep asking over and over throughout the process of designing a meeting or training session. We are all SO darn good at coming up with WHATs. Think about the typical brainstorming session that seems to start every group discussion…what is it that we generate? A long random list of WHATs. Maybe a few HOWs. We tend to jump over the essential WHY, the shared goal driving the group to work together in the first place. WHY are you having this meeting? Why invite these particular attendees? Why would they want to come? Why do you want to include this particular activity? I wouldn’t be surprised if my litany of WHYs becomes annoying to my clients. But without a clear WHY, it’s hard to design a WHAT that will actually deliver the desired results. My favorite diagnostic game at the moment is called Five Whys, explained on the Gamestorming website and originally created by Sakichi Toyoda, founder of Toyota Industries.